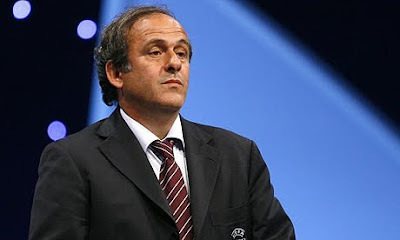 KIEV, Ukraine -- UEFA president Michel Platini on Thursday gave the Ukrainian government two months to show signs Kiev would be able to catch up on preparations for co-hosting the Euro 2012 soccer tournament. Platini, ending a two-day trip in which he toured Ukraine's four host cities, said he had spelled this out to President Viktor Yanukovich in a meeting, although in response to a journalist's question, he denied it amounted to an ultimatum. "I told him we need guarantees from the government on going forward and I told him that in the next two months we would like to see strong signs of advancing," Platini told journalists after a half-hour meeting with Yanukovich. "President Yanukovich gave guarantees that the work would be done and that he would do everything for the government to follow this," he said. Economic troubles, a severe winter and political tension have led to long delays in preparations by the ex-Soviet republic of Ukraine ahead of the 16-nation tournament which it is co-hosting with neighbouring Poland. Building work is five months behind schedule with particular problems in the stadium of the capital Kiev, which is due to stage the final, and the western city of Lviv. The other two Ukrainian host cities are Kharkiv and Donetsk in the east. Platini repeated that the executive committee of UEFA had said if the Kiev stadium was not ready, the Euro tournament would not take place in Ukraine. Asked what contingency UEFA might be planning, he said: "There is no Plan B ... no Plan C", but he also said UEFA could not afford to wait one and a half years to make a final decision. Yanukovich, who earlier this month conceded that preparations were "in terrible shape", told Platini Ukraine would now "move into top gear and catch up on delays." With the honour of Ukraine at stake he would now be monitoring preparations personally, his press service quoted him as telling Platini. Ukraine has already announced weekly auctions of treasury bills to help raise cash for Euro 2012 -- effectively adding to rising domestic debt problems. It also plans to launch a national lottery later this year. Euro 2012 minister Borys Kolesnikov has announced government plans to stump up 26 billion hryvnias ($3.3 billion) from the 2010 state budget to help modernise stadiums, develop airport infrastructure and build roads. Yanukovich has said that it will cost 40 billion hryvnia to catch up on the delay.